Improved Model C PadHead™ polishing & grinding head! Wayne, Miles Supply’s design engineer for the PadHead™ polishing & grinding head, continues to make improvements to his patented unique designs! The head already has made drastic improvements to the cutting of the stones, but including the low-profile aspects of this new design offers even more stability as well as versatility! 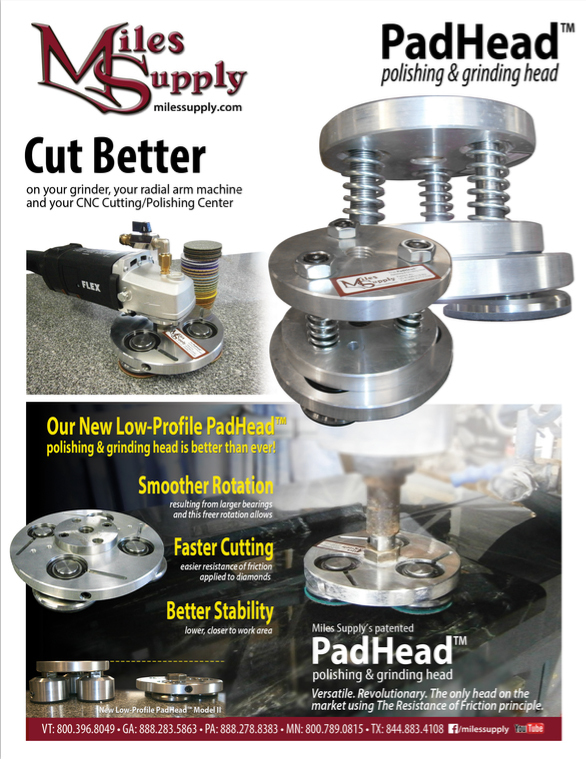 Click request for quote button or see flyer for PadHead™ model C and other applications for the low-profile PadHead™ polishing & grinding heads (pictured below). Improved CNC model now with the low-profile PadHead advantages! Smoother rotation; freer rotation allows for faster cutting with easier resistance of friction applied to diamond. Better stability; lower and closer to work area! The improved model C has 4 free-rotating heads which cut stone crystals with the resistance of friction. The spring loaded adapter with the PadHead works great on CNC machines, Top Polishers, and Flat Bed Polishers! Mounts on an ISO40 tool holder. It’s more than a model for only CNC, the head can run on most bridge saw machines! 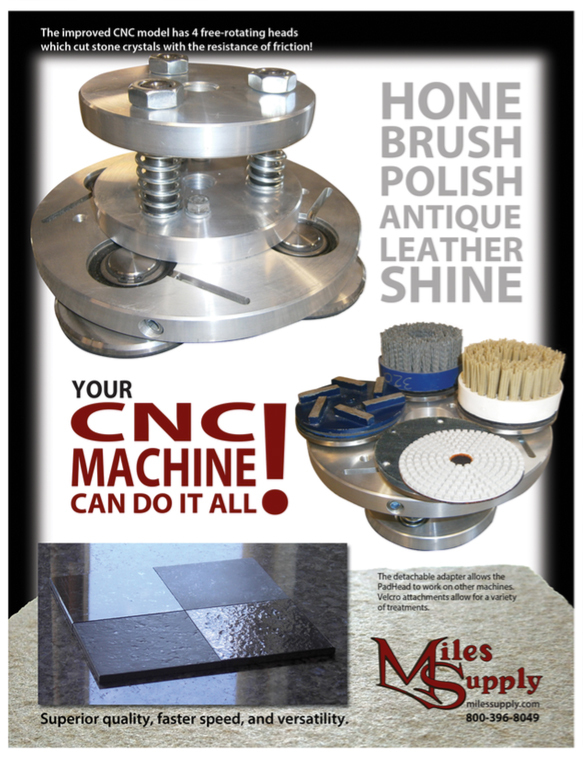 Miles Supply’s PADHEAD™ polishing and grinding head is the latest in polishing head technology. All of our models are a patented polishing and grinding head that increases production while lowering cost at the same time. They utilize a combination of both metal and resin pads in order to grind, hone, and polish any surface. Produced in the USA at a cost that is up to 50% less than competitive polishing heads, it is easy to maintain and repair. 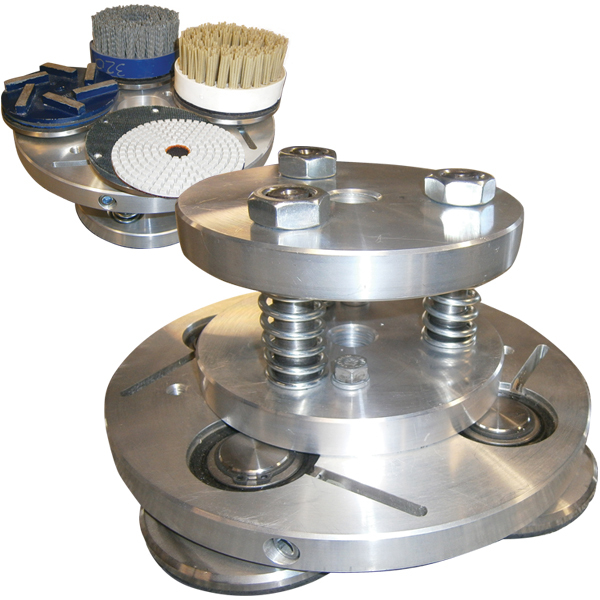 Can be adapted to nearly all polishing machines and floor machines with ease. WHY UNIQUE & REVOLUTIONARY? THE THEORY: Traditional polishing systems force abrasives in one direction creating dull cutting forces resulting in fractured crystals. PadHead™ wears the crystals, rather than fracturing them, providing a more brilliant finish with greatly reduced dust and slurry accumulation. One of the problems with the head was with control over downward pressure – which the PadHead™ polishing & grinding head – Model C can handle so much better!